In his BBC Radio 4 broadcast "RP RIP" of the 6th of August, Melvyn Bragg mentioned a certain Wilhelm Doegen, a scholar who had made recordings of British PoWs held in German camps during World War I. Who was Wilhelm Doegen? What did he do with the recordings? Are they accessible? Wilhelm Doegen was born in Berlin on the 17th of March 1877. He first completed a bank training program, then studied business law and economics. As a guest student he attended lectures in English Studies held by Alois Brandl at Friedrich-Wilhelms-Universität in Berlin (now Humboldt-Universität). Brandl inspired him to study modern languages. 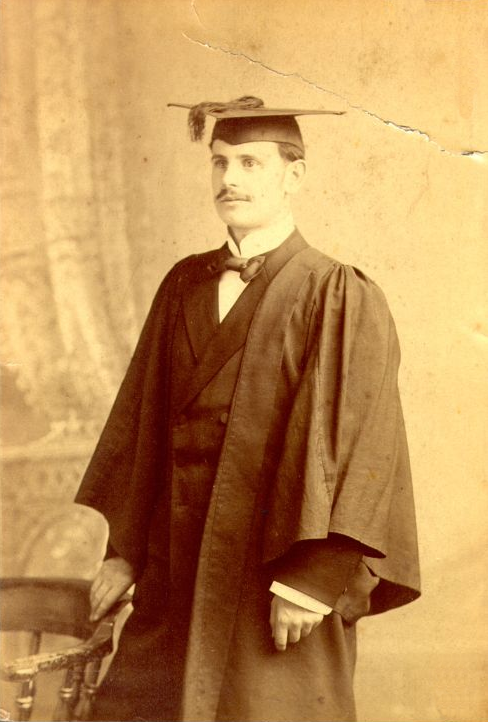 In 1899 Doegen spent a term in Oxford, where he studied under Henry Sweet. This was to become a crucial experience for Doegen. He finished his studies to become a teacher of English, French and German at a German grammar school. The title of his thesis was "Die Verwendung der Phonetik im Englischen Anfangsunterricht" (= the use of phonetics in elementary instruction in English). While he was a teacher he developed a series of books and records produced by the record company Odeon with the title: "Doegens Unterrichtshefte für die selbständige Erlernung fremder Sprachen mit Hilfe der Lautschrift und der Sprechmaschine" (= Doegen's teaching booklets for the self-instruction in foreign languages by means of phonetic transcription and the speaking machine (= vulgo: record player)). These records seem to have been fairly popular among German schools and universities. One source2 speaks of about 1000 institutions using them. In 1914 Doegen made a request to found a "Königlich Preußisches Phonetisches Institut" (= Royal Prussian Phonetics Institute). A committee was founded in 1915, the "Königlich Preußische Phonographische Kommission" under Carl Stumpf (a psychologist) and Doegen as its managing secretary. Among the roughly 30 members was Alois Brandl, one of the founders of the Institute for British and American Studies at Humboldt. Brandl was responsible for English dialects. 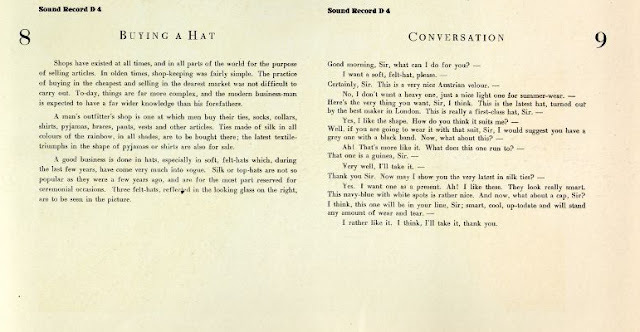 From 1915 to 1918 more than 250 sound recordings of languages and dialects were made on 1650 shellac records. Members of the committee visited more than 70 German prisoner-of-war camps. English PoWs were to speak the numbers 1 to 20 or the parable of the Prodigal Son (Luke 15, 11ff.) in their local dialects. In 1920 the "Lautarchiv" was founded by Doegen; the archive became annexed to the sound department of the Prussian State Library. Africanist and phonetician Diedrich Westermann became director of this department. In 1947 Doegen got a chair for English Studies which he held until 1951. He died on the 3rd of November 1967. To my knowledge the recordings are still not available to the public. It is planned, however, to digitise them and even to put them online. 1Holloway was a famous Australian actor in his day. 2Parts of this blog entry relied on research done by staff members of the sound archive of the Humboldt University in Berlin, especially by Jürgen-Kornelius Mahrenholz. Their work is gratefully acknowledged. By the way, how is Doegen pronounced? Can you tell me who the reciter was on the Odeon recording of Hamlet verses - Lawrence, London. Since the other record has W.J. 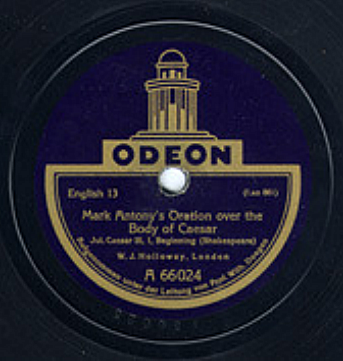 Holloway, London, I am assuming that London was the location of the recording. I'm afraid I can't help you. header background pic by http://www.hdwallpapersdesktop.com. Watermark theme. Powered by Blogger.